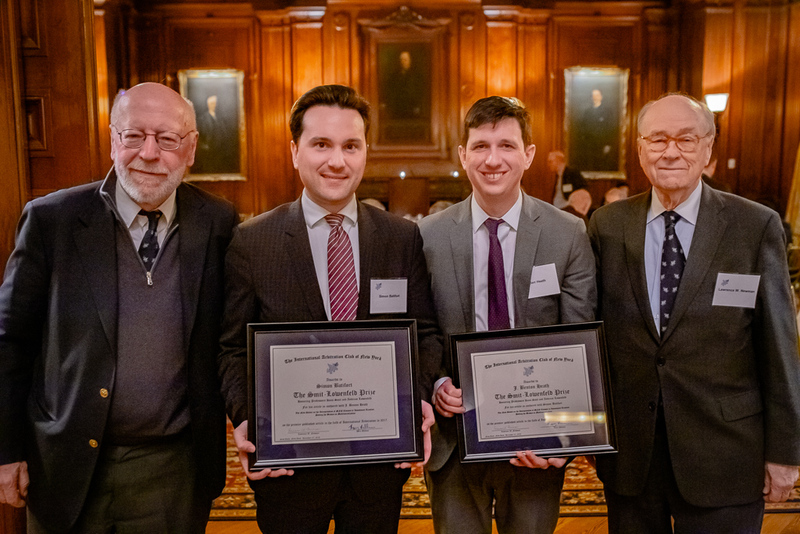 On January 22, 2019, retired Cravath litigation partner Rory O. Millson presented the International Arbitration Club of New York’s (IACNY’s) eighth annual Smit‑Lowenfeld Prize for the best article in the field of international arbitration, along with Lawrence W. Newman, Presiding Member of IACNY. The award was given to Simon Batifort and J. Benton Heath for their article entitled “The New Debate on the Interpretation of MFN Clauses in Investment Treaties: Putting the Brakes on Multilateralization,” which was published in the American Journal of International Law (Vol. III No. 4). Rory serves as chair of IACNY’s selection committee for the award, which honors the late professors Hans Smit, former Stanley H. Fuld Professor Emeritus at Columbia Law School, and Andreas Lowenfeld, former Rubin Professor Emeritus at the New York University School of Law, for their distinguished careers in the field of international arbitration, both as scholars and as arbitrators. Mr. Batifort and Mr. Heath’s winning article examines recent developments in how Most‑Favored‑Nation (MFN) clauses in investment treaties are used, arguing that the conventional view that MFN clauses can always be used to “import” substantive standards of treatment must be re‑evaluated in light of emerging evidence, including many states increasingly questioning that use. Pictured above (left to right), IACNY Selection Committee Chair and retired Cravath partner Rory O. Millson, prize winners Simon Batifort and J. Benton Heath and IACNY Presiding Member Lawrence W. Newman.